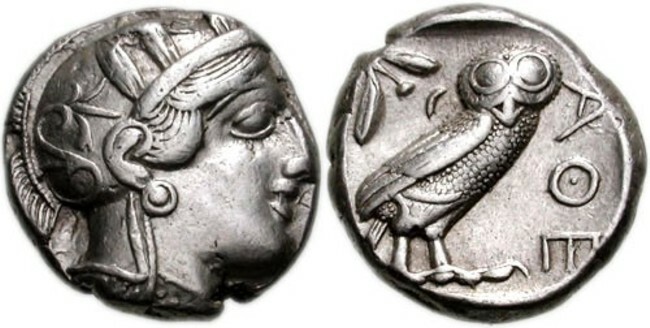 “Owl” is a common term for the Drachma, the most well known silver coin of ancient Athens. This coin generally had an image of Athena of the Obverse and an Owl on the reverse. There was a saying in ancient Athens about “taking owls to Athens”, meaning being redundant, like the English would say “taking coals to Newcastle”. Once the treaty was signed between Sparta and Athens ending the Peloponnesean War, the owls invaded Sparta as gold and silver currency was transferred to the victors. The result of this seemingly small event would prove to be calamitous for the Spartans. The Spartan authorities ruled that gold and silver hoarding was legal for the state as a monopoly and illegal for individuals. This unrealistic attempt at the control of wealth failed immediately and, instead, fostered the subversive social effects that derive from a money economy in the hands of a people previously sheltered from same. The new money impacted the Spartan attitude toward control of private property and drove the upper and lower classes further apart. Where there had been only a slow concentration of wealth since the reforms began, the imbalance now accelerated. And attrition at home would also grow worse on its own. Each Homoioi was given land to own in perpetuity – enough land to support his family. But the state kept no land for itself, so it had no mechanism to adjust an imbalance in the allocation of land to each Homoioi. How was a man to provide for multiple sons with only enough land to support one family? A policy that seemed logical at the time of the reforms now began to unravel, as Homoioi began to limit the size of their families or look for ways to add to their land holdings. The former was accomplished in any one of several strange ways including polyandry, wife sharing, and pederasty. With regard to adding to land holdings, the innovations were equally clever. A Homoioi could adopt a member of another family and receive that family’s holdings or a man could marry a women who was her father’s heir because she had no brothers. Others were able to acquire land by the taking of dowries, which were apparently large in ancient Sparta. The Spartan Government, once it realized the outcome of inaction, tried to combat this problem by offering an exemption from military service to those Homoioi with three children. A father a four was even exempted from paying taxes. How ironic that a system put in place to remove the cares of a man by giving him land would now create an undercurrent of subversive cupidity designed to avoid concern over a man dying landless. We can now see the reasons behind the rapid decline of Homoioi from the end of the Peloponnesean War to 371 B.C. (Leuctra) when there were only 700 left. Mr.Anderson great text(s),I am happy to read them.But if I may ask for clarification of only one word. Do you believe decline started that late as the end of the Peloponnesian wars? No, I believe it started much earlier. It was just accelerated after the war. See my next post where I will chronicle the entire decline.